The Brand New Nord Lead A1 is a 24-voice polyphonic, four-part multi-timbral analogue modelling synthesizer capable of reproducing all the nuances and personality of vintage synths delivering a surprisingly rich sound and wide range of colors. The Nord Lead A1 uses a brand new Oscillator section with many configuration shortcuts available for quick creation and editing of patches. The improved workflow lets you create sounds much faster than what is possible for synthesis of such complexity. This improved workflow concept is carried further in the modulation section with a single LFO and simplified Modulation Envelope using intuitive controls accessible directly from the front panel. This new designs lets you experiment with modulation much faster without compromising the overview of the structure of the patch. The filter section includes Low Pass, high Pass and band pass filters as well as to modelled Ladder M and Ladder TB filters which will provide some of the most sought after and recognizable filters. Each of the four slots features an independent effect processor with delays, beautifully rich reverb, Drive, Ring Modulation, phaser, flanger, and new and impressive Ensemble and Chorus which have been modelled on legendary vintage synths bringing the warmth and richness that most keyboard player longs for. In addition to the effect section, each slot boasts its own arpeggiator. Additional features include Nord’s highly popular Morph function which can be controlled via velocity or Mod Wheel allowing several parameters to be morphed in real-time. Master Clock Sync lets you synchronize the LFO arpeggiator and delay to the tempo. Four independent outputs are included which can be assigned to a voice. MIDI over USB is also featured. Added features since NAMM January 2014 include the new ‘Like’ function, a simple and brilliant practical feature to use during patch creation. When programming a patch it is often not clear if it is yet perfect. Now with the Lead A1 you can simply ‘Like’ what you have done into a temporary location and continue editing. You can Like up to 50 variations, with the ability to scroll between them to compare your favorites or go back to a specific Liked version to edit in a different way. When you are ready, save your favorite patch or patches to the Lead A1’s memory. The new Mutator function is a popular feature of the Lead 4 , which allows variations of a patch to be created by adjusting one, some, or all elements of a patch by set percentages. There is also a wild Randomize mode to create an entirely new patch with all parameters randomized. Another new feature is a newly designed “Fat-As-Fat-Can-Be” Unison Mode let’s the Nord Lead A1 challenge any vintage analog instrument. The all new Nord Lead 4 Performance Synthesizer boasts 4 part multi-timbrality and an all new dual oscillator virtual analogue sound engine with 2x oversampling, new filter types and built in effects processor. And you get USB MIDI and 49 velocity-sensitive keys. In addition to the Nord Classic Analogue Waveforms the new synth incorporates Wavetable mode with unique Formant Wavetables. Frequency Modulation and Hard/Soft sync options are available to allow you to “trash” your sound to new levels, the True Voice Unison mode can stack up to 4 voices to create truly awesome fat lead synth sounds and deep pad sounds. The filter section on the Lead 4 includes Low Pass, High Pass, Band Pass and now spectacular simulations of two transistor and diode ladder filters offering that dirty character of their ancestors. Nord have incorporated a new “Variation” button that let you override almost any parameter. The Lead 4 has 7 assignable Variations per program giving the user the ability to warp and improvise sounds in real time, this can be done both sonically and rhythmically. Nord have also popped in Master Clock Syncronization which means this can be done in perfect sync to other layers or to an external MIDI clock. The 4 slots have their own dedicated effects sections including delays, reverb, tube amp simulated overdrive, a talk effect modeled after a vocal tract and a sample rate reducing “crush” effect. Another new tool to the Lead series of synthesizers that empower the user to create unique sounds and work away from the norm. Quite simply if you thought the Nord Lead 2 belonged in your synthesizer arsenal then make space for the Nord Lead 4. 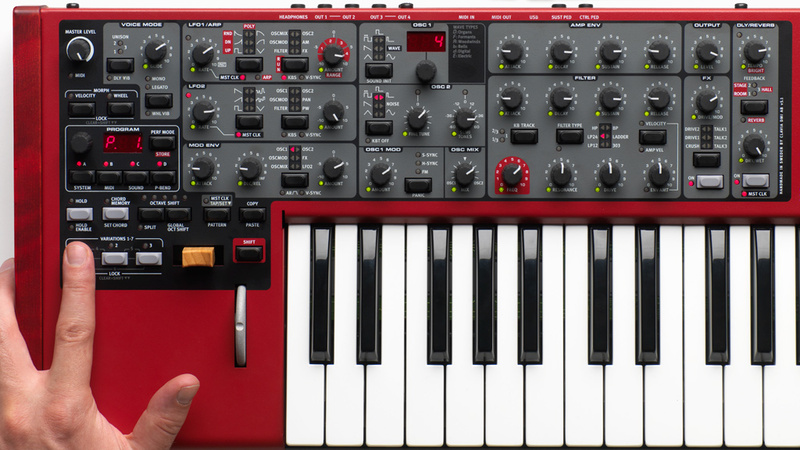 Like it’s predecessor the Nord Lead 2 the Nord Lead 4 is available in both four octave keyboard and rack/tabletop versions, simply known as the Nord Lead 4R . The new Nord Electro 4 HP Hammer Action Portable keyboard new features turbocharge your performances. The Electro 4 HP features 73 keys superb hammer action portable E-E keybed with 4 selectable dynamic response curves, 9 Digital LED drawbars on the organ section, Double memory capacity ; 380 MB flash memory is dedicated to Nord Piano Library and 128 MB flash memory to Nord Sample Library, 40-60 Voices Polyphony for Piano Library sounds and 15 Voices for Sample Library sounds, Nord C2D Tone wheel simulation with enhanced 122 Rotary simulation and Drive, MIDI-over-USB, enhanced Sound Manager functionality, Effects; Effect 1, Effect 2, Three band EQ, Delay, Compressor/Amp and Reverb. The Nord Electro 4 HP has twice the memory capacity to that of its predecessor the Nord Electro 3 HP, and this is important due to it’s extensive sound library that you would want to load on board. The Electro 4 HP’s Organ section has been upgraded to the latest Tone Wheel engine that you can find on the C2D dual manual organ and a pair of stunning new vintage Leslie simulations. Nord has improved the percussion and key click by modelling each note’s click giving a truly authentic sound. Tons of superb sounds – the pianos section is divided into six different types; Grand for acoustic and electric grand pianos, Upright Pianos, Electric Piano 1 with tine, Electric Piano 2 with reed, Clavichords/ Harpsichords and Samples from the sample library. Each of these types has instrument models and they sound and feel very authentic. Steinway Grand Lady D piano sound is superb and if you like something a little brighter you can choose the excellent Yamaha Bright Grand. The Nord Electro 4 HP is a professsional keyboard for live playing. Weighs merely 11 kg, this keyboard is extremely portable, very playable, with quality effects and great piano and organ sounds.